Our Oslo cruise port guide gives you information about the docking location, cruise dock, transportation options and much more! 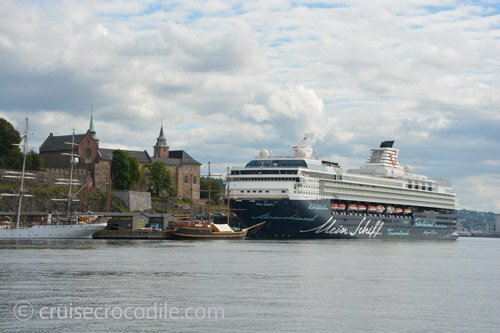 Welcome to the Oslo cruise port guide. Oslo is the capital city and most populous city in Norway with just over 600.000 inhabitants. The Norwegians classify a town of over 30.000 inhabitant to be a city. Bergen being their 2nd largest city with 260.000 inhabitants. So you could imagine that Oslo is something different to the Norwegians. They often call it their only city and this is how everybody like it. Most Norwegians would never dare to come to the big cities but there is always that crowd that embraces that with open arms. When walking in Oslo you can see that everything is so well thought out. The way that the city is with its main street Karl Johan, pedestrian area, with it’s ambiance and architecture. And what you’ll also notice is that it is changing. There are so many cranes you will be able to spot on the horizon if you take a look from your ship. The waterfront is changing, the architecture is changing and the traffic is changing. Oslo is really classifying itself as the metropol it deserves to be. Go out and take in all that city life. There is always something new to explore in vibrant Oslo. Cruise ships can dock at several location ins Oslo. There is 1 cruise terminal in the port of Oslo. This is at the Akershus pier. Inside you will find shops, map, wi-fi and global refund services available. From here it is 10 minute walk to the city center. In the background you can already see the city hall. Only the Akershus pier has a terminal with maps, Tax Refund services, shops and wifi. The other docks do not have these facilities although maps are sometimes brought to the pier. All docks are about 1 km from the Karl Johan Gate (main street). The nice thing about all of the docks is that the city center is so close and most things are within walking distance from here. There are 2 important attractions for which you will need transportation to get to. These are the Vigeland park and the Bygdoy island on which Viking ship museum, Kon Tiki Museum, Fram Museum and the Open Air Museum are located. Find out underneath how to get there. Oslo might just have the best local transport system and transportation option of Norway. Taxis are generally in the morning available right outside the port. Official taxis you can recognize by their taxi sign. If there are no taxis there the security at the gates is usually able to call you one. Keep in mind though that taxis in Norway are expensive. Take into account it will cost you about 700 NOK (100 USD) per hour and 25 USD for an easy taxi ride of 10 minutes. But there are definitely other cheaper options available for you. There is a hop on hop off bus available in Oslo. It doesn’t matter where you dock, these guys will make it work to pick you up. Hop on hop off bus is quit a nice way to get around the city. If you are planning to visit the place out of the city center this is a nice way to do it. Buy your ticket on the pier and hop on. The bus is wheelchair accessible. Keep in mind though that sometimes this service tends to sell more tickets than they have capacity and that could mean you might have to stand for a long time at a stop for the next available bus. At the Akerhus pier there is a stop for a little trolley train. It takes you around for a city tour. – Does the hop on hop off bus accept credit card? Yes, they do. – Where can I change money? You can change money at the tourist information centers. Keep in mind it is probably cheaper for you to get it out of an ATM. Don’t change to much in NOK. Changing money costs money and changing back cost even more. 98 % of all businesses take credit card in Norway. – How do I pay for a ticket for public transportation? If you prebuy them at the tourist information or at a kiosk it is cheaper than to buy them separately on the bus or tram. – How about the accessibility of Oslo? Oslo is wheelchair friendly. To find the details visit this website by clicking here. Click here for more information on the sailing route in and out of Oslo. This new attractions in Oslo is the perfect combination of nature, art and history. Go for a scenic walk in the park and find beautiful sculptures that represent European art history of the last 130 years. At this point you will find about 31 sculptures here, but more will come. The park is about 3,5 km east of the port. Take tram 18 or 19 to Ekebergparken or bus 34 or 74 to Ekenberg camping. At the “museum island” Bygdoy you will find the world famous Viking ship museum. In the late 19th century several viking ships were found in the Oslo fjord. Due to the mud and conditions the ships were almost completely in tact. The Oseberg ship is the jewel of the exhibition. It was found by a farmer in 1903. The excavation took 3 month and the restorations 21 years. 90% of the ship is made of the original timber. It now shines together with the other viking ships and viking exhibitions in the Viking ship museum. The museum is about 5,5 km south west of the port. Reach it by public bus 30 or hop on hop off bus. The main street of Oslo, Karl Johan Gate, is about 1 km walk from the dock. This pedestrian street runs all the way from Central Station to the Royal Palace. If you are looking for an easy day in Oslo and want to see a couple of main highlights: make sure to walk this street from beginning to end. Or if you are looking for a good day of shopping, this is for sure the street to start on. In the middle of this Oslofjord you will find this tiny working lighthouse that nowadays is also a high quality restaurant. If you make a reservation beforehand you can enjoy a special lunch or dinner at this unique location. Their contact details are: dyna@dyna.no. They will also arrange for a boat to pick you up at City Hall. The jump itself is already impressive from the parking lot, let along from all the way at the top, but also the museum is definatly worth it. Take the metro or taxi to get up and enjoy the spectacular views over Oslo and surrounding area. See map for it’s location. For you foodies out there: don’t miss the Marthallen. This is the place to go to for everyone who appreciates high quality food, drinks and something unique. You will find everything from fish, meat, vegetables, baked goods and coffee here. The Marthallen are a little bit outside the city centre of Oslo. It is either about 30 minutes walk from the ship or you can take tram 12 from central station or city hall to Schous class. The eastern docks are close to the central station (about 1 km walk). If you dock here than the Central Station is a great location to kick off your journey. The Oslo city hall is one of the most impressive buildings in the city. Make sure to pay an inside visit. See map for its location and you’ll find out it is less than a 10 minute walk from you dock. Thor Heyerdahl is the famous Norwegian adventurer and scientist who tried to recreate prehistoric voyages. With boats like the one above he tried to cross the oceans to prove that ancient civilisations had the ability to migrate from continent to continent. Especially the Kon-Tiki exhibition made his name famous around the world. Reach the museum by taking bus 30, ferry 91 from the City Hall or take the hop on hop off bus. Most of the times your ships docks in front of the Akershus fortress. Make sure to visit this wonder premises. Whoever would rule Akershus would rule Norway. It is a medieval castle that was build in 1290 to protect Oslo. It has been many thing ever since and that is something that you will discover as you go from museum to museum that are all located in the fortress. The network of trams in Oslo is extensive. Especially line 12 is a usefull one because it goes to the Vigeland park. Pick it up at central station or at the city hall. Oslo is the perfect city to explore by bycicle. The city has plenty of facilities to rent one. Best way is to go to the tourist information and rent one there. 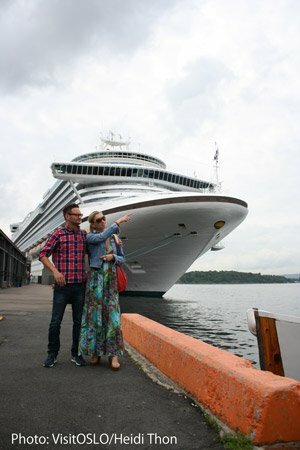 There are several locations where cruise ships can dock in Oslo. Check out http://www.oslohavn.no/en/passengers/passenger_traffic/cruise/ to see where your ships will dock when in port. 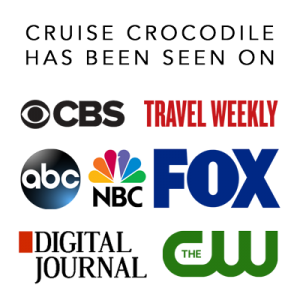 Most cruise docks are within easy walking distance of the city center. Some have better facilities than others. Check out our full Oslo cruise port guide for all the information. If you are interested about the history of Norway during World War II this is the museum to go to. Find it in the Akershus close to the dock. Scandinavia is famous its ice bars and we feel you at least have to visit one in your life. In Oslo you will find Magic Ice. It is a bar where everything is made of ice; the bar, your chair, your glass. Find it in the city centre of Oslo, just off the main street. It is about 1,5 km walk from port (depending on where you dock). Check its location on the map above. 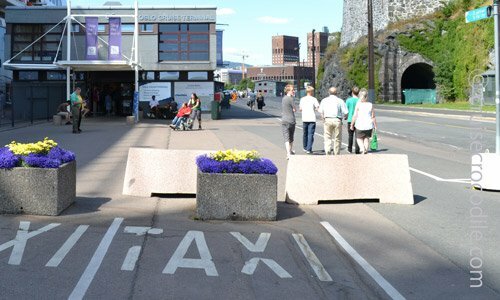 If you are planning on visiting the Fram Museum, Kon Tiki Museum or Norse Maritime Museum you can take ferry 91 from the dock in front of the city hall. 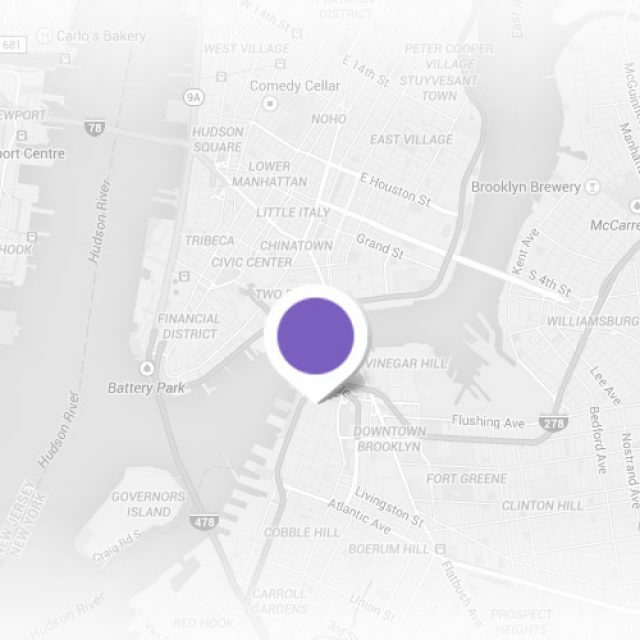 Check the map above for its location. If you dock at the eastern docks this is the first building you will see. This magnificent structure is the famous Opera House of Oslo. After its opening in 2008 it immediately became a tourist attraction. It is beautiful inside and outside. There are often beautiful exhibition at the entrance and you are able to walk all the way to the top for a breathtaking view over Oslo. Gustav Vigeland is one of the most famous Norwegian artists. For the last 20 years of his life he worked on 212 bronze and granite statues that he left to the city of Oslo. 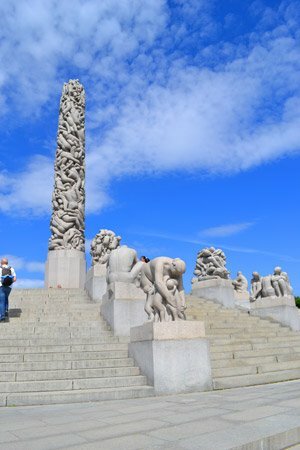 Visit the Vigeland (or Frogner Park) to witness his truly beautiful statues. Take tram 12 or hop on hop off bus to get there. See map for tram stops and location. Norwegians largest museum of cultural history definitely comes recommended. It tells the story of how the Norwegians lived from the 1500’s to the present day. Out of the 160 buildings the Gol stave church is the eye-catcher. This is a unique stave church of which there are only a few left in the world. The museum is about 5 south of the port. Reach it by public bus 30. The National Museum exists of several locations throughout the city. The National Gallery, Museum of Decorative Arts and Design, Museum of Contemporary Art and National Architecture museum and more are all part of the National Museum. If you appreciate art this is definitely the place to put on your list. You can find the locations of the museum in the map above. At the end of the main street Karl Johan Gate you will find the Royal Palace. In summer time the palace is open to the public, but only for guided tours. It is advised to pre-buy the tickets. Click on this item to be forwarded to their website for details about the tickets. At the harbour you will find the Nobel Peace Centre. It is a museum about the Nobel Peace Prize. It tells the story of Alfred Nobel and the Peace Prize laureates and their engaged and groundbreaking work. The museum also has changing exhibitions that provide insight into the fields of war, peace and conflict resolution. Find the location of the museum in the map above.